See more video hacks on Holley’s YouTube page! 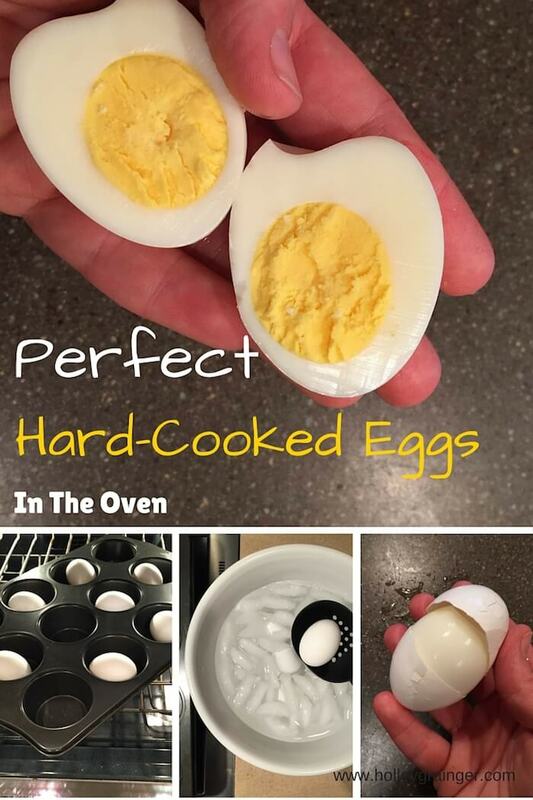 Place eggs in a dry muffin tin in a preheated oven. I vary between 325 degrees and 350 degrees but it will be important for you to find the best temperature based on the doneness you prefer. I bake at either 350 degrees for 25 minutes or 325 degrees for 30 minutes. 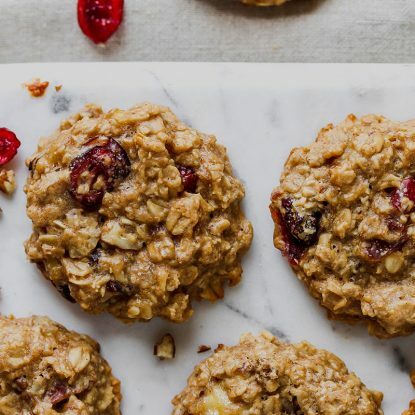 Note that you do not need to fill up the muffin cups with water or spray with cooking spray. 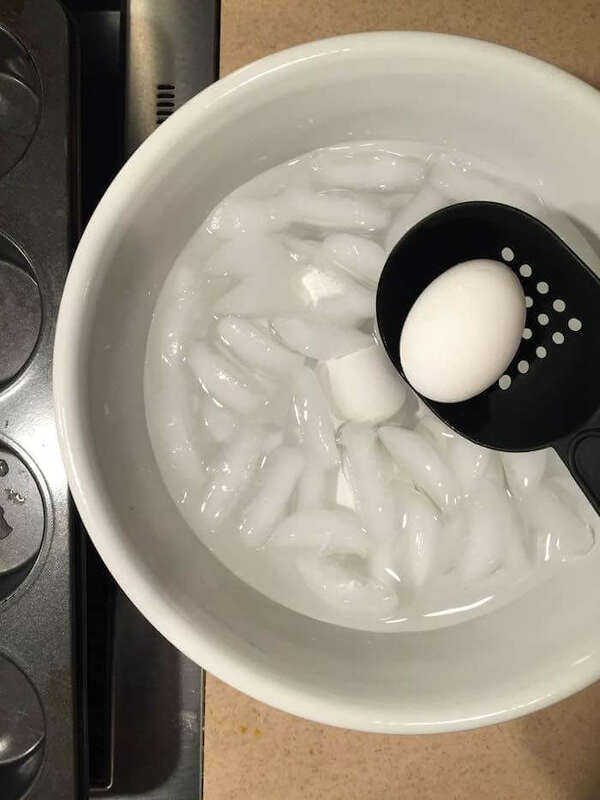 Once eggs have baked, transfer them to a bowl of ice water for 10 minutes. This will stop the cooking process and prevent the eggs from overcooking. Note that the eggs may have brown spots on the shell after baking. Also, the egg may have a small brown spot where it set in the pan. 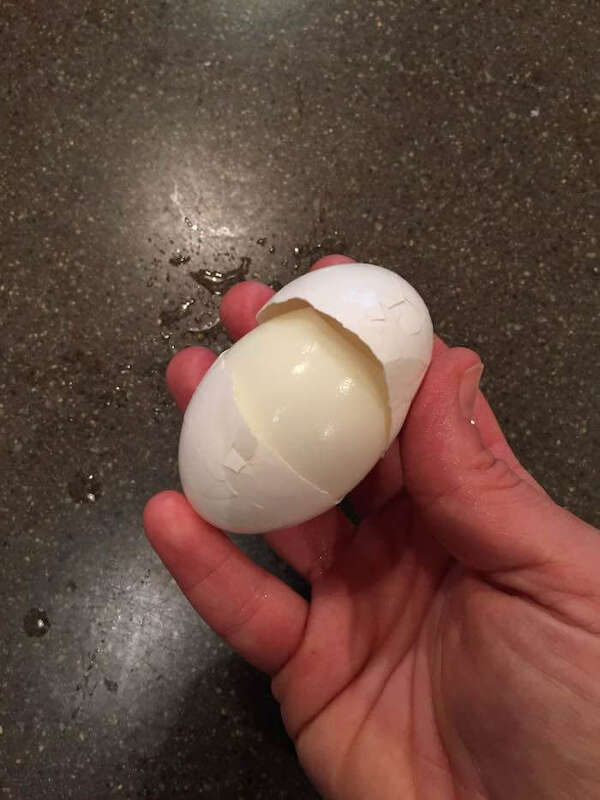 Crack one of the eggs gently on the counter on gently peel off. You’ll be amazed how easily the shell peels off! Enjoy these eggs as is, chopped over a salad, sliced onto toast, deviled, or whichever way you prefer. One thing is for sure though, you’ll never go back to the water boiling method again! How do you make your eggs? 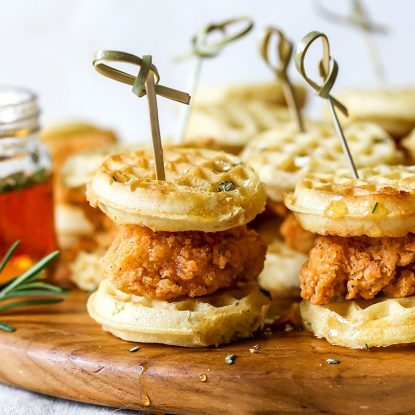 Do you have a favorite egg recipe? Please share in the comments!! 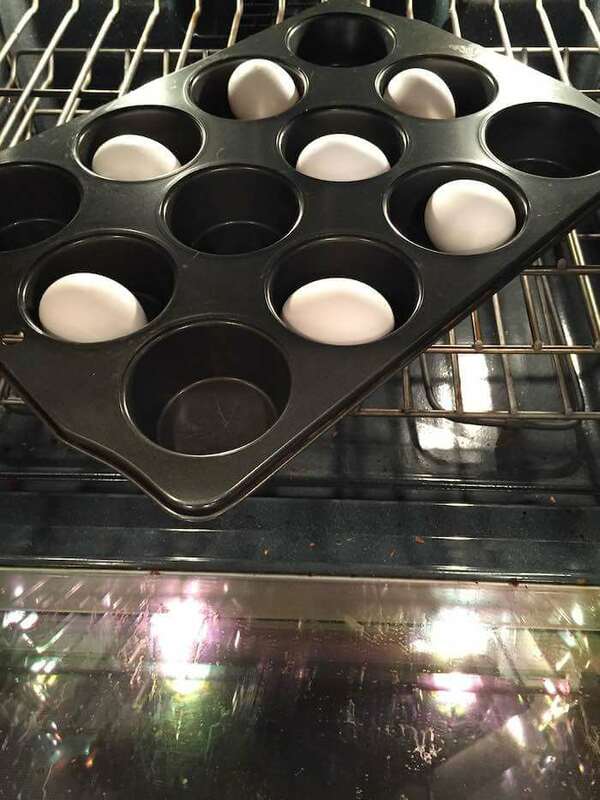 Place whole egg into individual dry muffin cups (1 in each cup). Bake at 325 degrees for 30 minutes (you may also bake at 350 degrees for 25 minutes). Transfer eggs to ice bath for 10 minutes. Store in the refrigerator for up to 1 week. 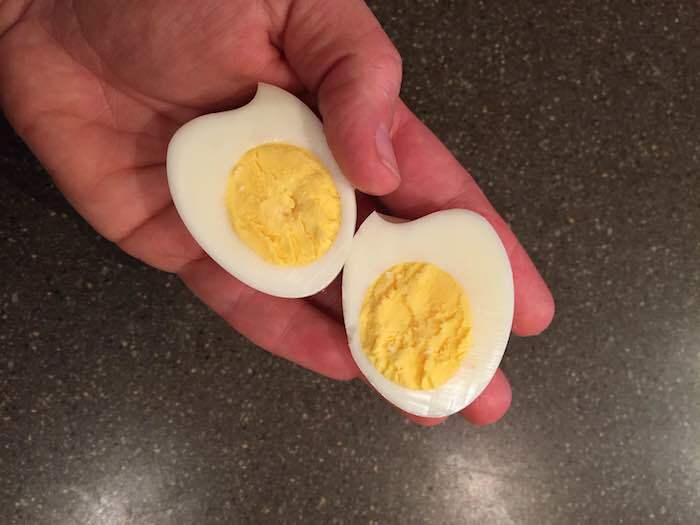 Hard cooked eggs from the oven??? Boyoboy am I intrigued! So gotta try this – thanks so much! Yes! Let me know if you do! Anything that makes the peel come off easily is my kind of technique! Can’t wait to try this! I agree! Let me know how you like it! This is such a great idea! 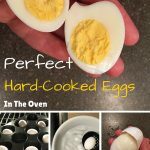 I’ve got to try it because I always put the eggs in the pot and then forget about them and the water boils off and I’m left with a mess! Yes! It has been a game changer! Plus, they’re so easy to peel! I agree! How long do you cook yours? What temp? We moved and have a new (old) oven so I’ve been playing around to get my time right. Can I use this method for Easter eggs that will be colored? Is there a way to avoid the spots? Hi Jenn! I’m sorry I missed this question before Easter. I haven’t found a way to avoid the spot when hard cooking since the egg sits on the bottom of the pan (which is where the little dot appears). I need to experiment to see if egg dye will cover it. 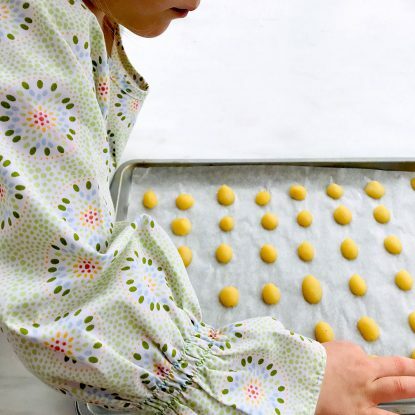 Did you end up baking or boiling your eggs? If baking, let me know if you had luck!